Delete, NoLionsInEngland, Leeone102, HowAboutNo, Buddz909 and Joeppo are all well know names amoung the streetart and graffiti communities. All six photographers have been documenting the ephemeral graffiti and street art that constantly ebbs and flows across London's streets, rooftops and tracksides. They recently held a photographic exhibition as part of the Shunt Live weekend event at the ICA in London. 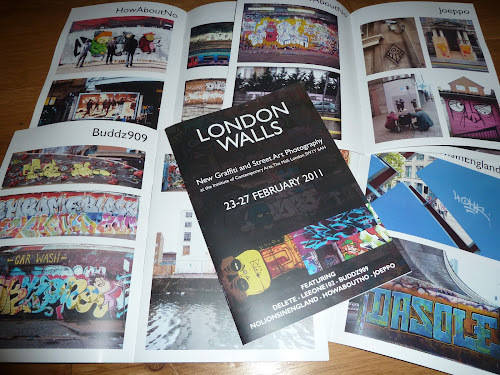 The 'London Walls' show featured a collection of some of the photographer's best photographs which had been beautifully printed. It was refreshing to see some of these photos actually printed and on display in frames rather than on a computer screen. The show has now finished but they did produce a photographic London Walls zine which was available on the opening night of the exhibition. If you missed the opening, they still have a few copies of the zine left which they have made available to purchase. The zine is 28 pages, full colour, glossy paper. £3 plus 70p&p. To purchase a copy email: mail@multiply.me.uk for details or if you are on flickr you can flickr mail Nolionsinengland.